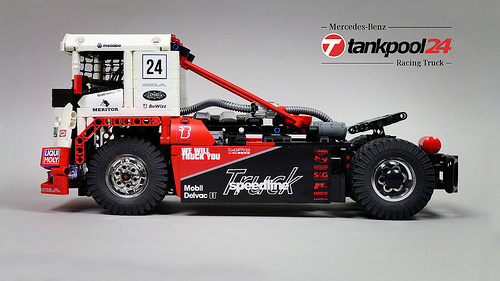 We’ve featured some amazing remote control off-road vehicles here at The Lego Car Blog over the years. However despite their engineering excellence, they’re often massive, heavy, and very expensive to build. Not so today’s creation, which comes from previous bloggee, published author, and all-round Technic legend Sariel. Sariel has decided to take the Technic off-roader formula and simplify it, using normal parts, light weight, and an affordable price tag to create his very green Jeep Wrangler Trailcat. Three Power Functions motors, a battery box and a standard IR receiver provide remote control drive, whilst simple oscillating axle suspension and four-wheel-drive (with no differentials) allow Sariel’s Trailcat to off-road like a much larger model. All in it weights under a kilogram, and such simplicity means that we think it would make a very good LEGO set. Fortunately Sariel thinks so too, as he’s published his Jeep to the LEGO Ideas platform where it could become an official LEGO set. You can find all the details via Sariel’s website, the Eurobricks forum or via the video below, where there are links to LEGO Ideas and you can add your vote. This remarkable looking thing is a 1918 British Mark V tank that saw duty in the final months of the First World War. With an engine (built by Ricardo, who now make the twin-turbo V8 engine fitted to McLaren supercars) mounted in the centre of the crew’s cabin the Mark V was a miserable place to spend any time in. Ponderous, painfully slow, and unreliable, these early tanks were no fun at all, but they would change the course of warfare for ever. This beautiful Model Team style recreation of the 100 year old Mark V comes from Master MOCer and TLCB regular Sariel and it’s packed with brilliant engineering. With an XL motor driving each track Sariel’s Mark V can cross 22cm wide gaps, climb 9cm vertically, and ascend a 60% slope thanks to the 176 rubber feet mounted to the tracks for traction. This means that just like your Mom at a free buffet, nothing will get in its way. Sariel’s Mark V also features a working 6-cylinder piston engine inside a realistically replicated cabin, a functional un-ditching beam, and two remote controlled side mounted guns that can rotate and elevate. Twin SBrick bluetooth bricks take care of the control signal, and mean that the Mark V can be controlled by a mobile phone and – more coolly – by a Playstation controller! 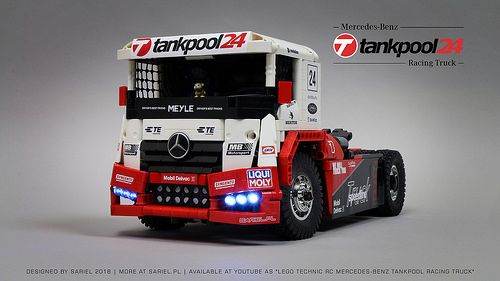 There’s lots more of Sariel’s Mark V tank to see at his Flickr album by clicking here, and you join in the discussion and watch a video of the model in action at the Eurobricks discussion forum by clicking here. If you were wondering where we were before today’s posts, seeing as things had gone very quiet here at TLCB, let us explain. It’s all Sariel‘s fault. This is his awesome remote control Ford Raptor Trophy Truck; a twin buggy Motor propelled, long-travel suspension Technic monster, with a 15km/h top speed. A typical TLCB Elf cannot run at 15km/h. At least not for a sustained period. And thus, as has become standard practice in TLCB Towers, our Elves were duly mown down in the corridors by the delighted Elven pilot of Sariel’s machine. So fast, nimble and tough is Sariel’s Raptor that almost every Elf in the office at the time became a road traffic accident statistic (if we ever bothered to record the casualties), before the driver finally lost control and crashed the Ford into the water cooler and alerted staff to the carnage. With the victims mostly patched up and all the errant Elven body parts put into the food recycling tub we’ve been able to return to blogging today, so whilst we go through our mailbox and award Smarties to successful Elves (including the one responsible for today’s smushing), you can check out Sariel’s brilliant Ford Raptor Trophy Truck by clicking here, plus you can watch it in action courtesy of the excellent video below. This Thunderbirds-looking thing is actually a GAZ 3351, a real all-terrain transport vehicle with its roots in the Soviet Union. Well, this one’s made of LEGO, but you could buy a real one if you wanted to. Which is what we suspect the Elves, if they had any money or concept of money, would do – such was the joy (and carnage) amongst them when this powered into the office this morning. Driven by an XL Motor inside each section and steered via a linear actuator powered articulated pivot, Sariel‘s GAZ 3351 can go almost anywhere, and over almost anything – TLCB Elves included. The four tracks providing this go-anywhere, smush-anything ability are suspended via oscillating bogies, and are constructed from 560 individual rubber axle-joiners. This gives the GAZ incredible traction, but the design wasn’t without its teething problems, which you can watch in Sariel’s excellent development and demonstration video below. There are more images to see of Sariel’s GAZ 3351 at his photostream too – click here to take a look. This stunning recreation of the M577 APC from the Aliens movie comes from Technic legend, previous bloggee, and ‘Become a Pro‘ interviewee Pawel ‘Sariel’ Kmiec. Sariel’s incredible creation packs in all the firepower of the original movie vehicle, with a 360° rotating, fully retractable sliding rear turret, twin roof-mounted opening missile pods, a rotating and elevating front turret, an electrically sliding cabin door, all-wheel-drive and all-wheel-steering with pendular suspension, and full LED lighting. All of that can be controlled remotely thanks to a third-party SBrick bluetooth system, allowing the half-a-metre long APC to be operated via a smartphone. To truly see what Sariel’s spectacular creation can do we highly recommend taking a look at the brilliant video below, plus you can see all the images of the M577 APC via both Flickr and MOCpages. Built in 1:8 scale Sariel’s Huayra is a perfect Technic replica of the ultra-rare Italian hypercar. The bodywork, constructed from LEGO’s Technic panels, flex tubing and lift-arms, is a work of art, but it’s what’s underneath it that is truly remarkable. A remote control drive train, controlled by a third-party SBrick bluetooth module, powers the Huayra, with a remotely operable two-speed gearbox and fully independent adjustable suspension included too. There are opening doors, and functioning turn signals, reversing and brake lights – all engaged automatically when the Huayra turns, reverses or decelerates. Yes, decelerates – because Sariel’s Pagani features remotely operated working pneumatic brakes and the Huayra’s trick active aerodynamics, including the front and rear spoilers deployed on each side when cornering and the rear-mounted airbrake used during heavy deceleration. The whole set-up is a delight to watch and you can do so via the beautifully shot video below, plus you can see the full gallery of exquisite imagery via Sariel’s photostream – click here to view one of the finest Technic Supercars ever built.